A quiet tabby cat looked up as the door opened and reached a paw through the bars of her cage in a tentative, hopeful greeting. Her name is Vanessa and she currently resides at the Isable Y. Garcia Animal Shelter in Port Isabel. Vanessa is about 2 years old. She was adopted from this very same shelter, but was surrendered by her owners after someone in their household developed an increasingly worse cat allergy. It was a heart wrenching decision for them, said shelter staff member Lexus Martinez Wednesday. But Martinez has hopes Vanessa, along with the rest of the shelter’s residents, will find their forever homes this Saturday when the shelter will celebrate Clear the Shelter, an adoption drive event observed by shelters across the country. 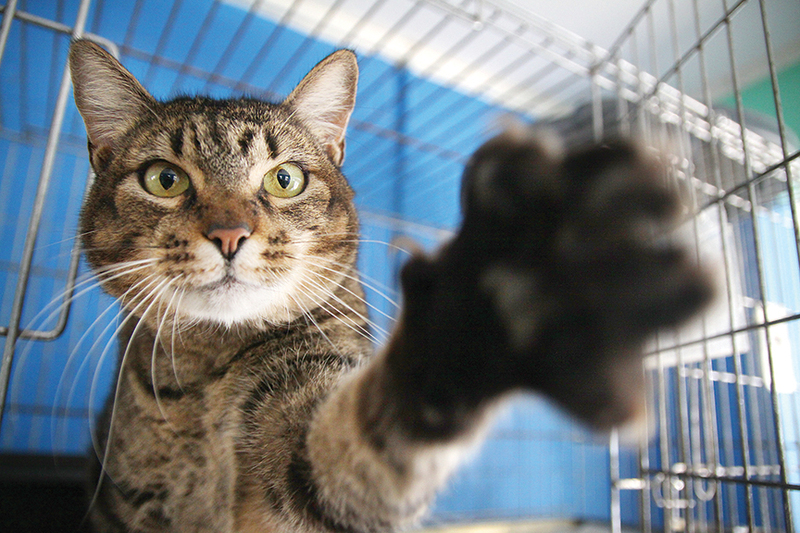 “Our goal is to clear the shelter, get as many animals adopted as we can,” Martinez said. Though normally only open Monday through Friday, the shelter will open its doors on Saturday from 9 a.m. to 4 p.m.